The next best feedback you can ever give someone is, Keep doing what you’re doing. Even if they’re doing a terrible job, you’ll avoid conflict and also ensure they won’t get so good that they outshine you. Although some people pretend to want honest feedback, you know nobody wants to hear the truth, let alone improve, so just get their tail wagging with a pat on the head and keep doing what you’re doing. Just like in school, a couple check marks and not getting held back each year is all any human ever wants, why encourage anyone to get better? Improving is for people who can’t work hard enough to keep doing what they’re doing. Like Rafael Nadal, of course it’s true that people who keep getting better tend to win more, but they also only keep getting promoted to the point where other people fail. The Peter Principle demands that you must be good enough to keep getting promoted, but not so good that you actually excel. As one of my favorite book titles states, What Got You Here Won’t Get You There, and keep doing what you’re doing is the surest way to avoid succeeding to ultimately fail. It’s scary to drive and you’re much better off just keeping your head down. Maybe you could avoid that wall you’ll eventually hit, but with your head down driving hard you might even punch through concrete. Some people say, pick your head up, set goals. What the hell do they know? Once you’ve set goals, now you’re on the hook, you likely have to get better, and that will only lead you to fail more successfully anyways. Most truck drivers hate that phrase. They say it implies that all they do is drive, when in reality it takes a lot of skill to pilot an 18 wheeler. Of course anyone with two feet can drive well enough, and when you’ve got all that momentum behind you, nothing can stop you from keepin’ on keepin’ on. That’s the success myth. 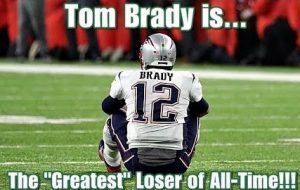 That somehow people who strive to do things better win more, but just look at Tom Brady. I tried to read his book on his fancy sounding TB12 method. Guy just doesn’t get it. Come on. He’s throwing a ball. My neighbor’s kid can walk. He can run. He can throw a ball. Keep doing what he’s doing no doubt he could win a few Superbowls. I could have written Brady’s book in 8 words: Just throw the ball, someone will catch it. He’s so confused that preparation drives success, when just about anyone can get it right a few years in a row. What’s with that guy and his principles? What a way to waste your life! He’s spent all this time thinking about things that are fascinating to him and coming up with all his stupid ideas on living his most amazing life. I just don’t get it. I tried to read his book and all I saw were hundreds of principles that he’s used to make billions of dollars. It’s only a matter of time before Dalio humbly admits his luck. In his game just about anyone can get lucky for 30-40 years (other than Paulson, Einhorn, Perry, Robertson, Ackman, Lampert, and just about every other manager), and surely anyone could replicate his success if they just kept doing what they’re doing. Obviously, the secret to success is never do anything different, and it’s just a matter of time before someone knocks that know it all Dalio off his high horse. I’d need one less word to write his book: STFU Ray, keep doing what you’re doing. Sure, if we just kept doing what we’re doing each of us would still be crawling and the human race would be swinging from the trees, but at least we couldn’t fail at evolving. No good loser needs to adapt and grow. It’s easy enough to fail just doing what you’re doing, so why on earth would you actually focus on improving if eventually you’ll fail closer to the top anyways. If you don’t hit the wall, you’ll certainly lose in the end.